Knit Christmas Stockings Red Green Extra Large 28" : cozy winter sweater by the fireplace inspired this design. Each is knit from thick wool-blend yarns with a large loop for hanging. Lightweight polyester satin inside lining adds stability and prevents stretching over time and makes them easy to stuff. Measured along the diagonal from the top left hand corner to the toe, the stocking measures 28 inches (give and take an inch or so), and the width along the cuff is 6.5 inches. These are REALLY large stockings, check out the additional pictures, we took a photo of a group of our knit stockings with a chair so you can appreciate how large these stockings are! 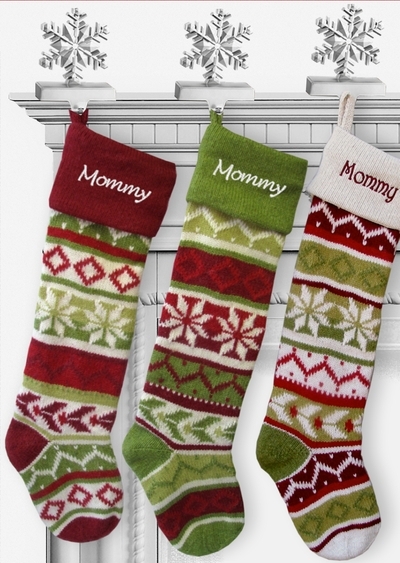 Materials: The stocking is made from green, red and white polyester wool blend - extra thick yarns. The inside lining is polyester satin material. We carry 3 similar designs as pictured so you can make a set! Lining: YES. This stocking is fully lined inside.